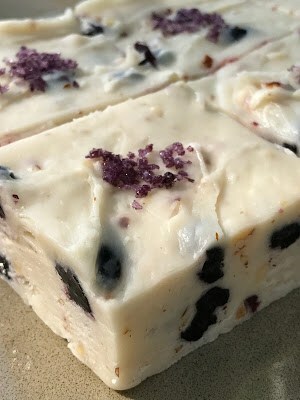 White Chocolate Blueberry Fudge is made with a ‘new’ to me product, a salt called: Icelandic Blueberry Sea Salt. Icelandic sea salt is from a wonderful company called Nordur Salt. 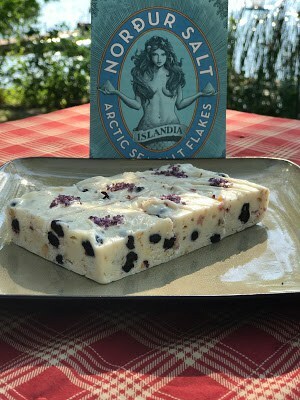 Nordur Salt Company was kind enough to send me a few samples of their great sea salt and one of the samples I received was for this delicious blueberry sea salt. Nordur is an Icelandic word and it means ‘going north’. When I first decided to make this fudge, I wasn’t sure how it was going to turn out. 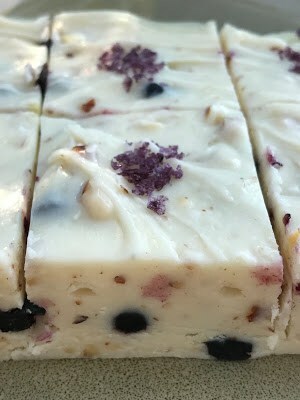 After all, this fudge is made with mini marshmallows, white chocolate chips, ground almonds, dried blueberries and blueberry sea salt. Not your usual fudge ingredients. I wasn’t really sure what to expect. I decided to jump in with both feet, and I’m so glad that I did. 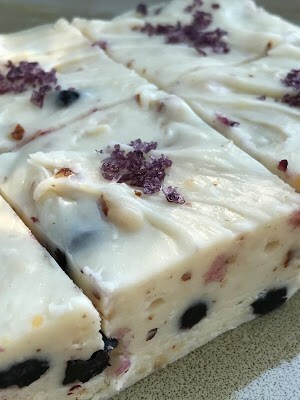 White Chocolate Blueberry Fudge turned out fantastic. Nordur Salt has a philosophy, they love and care about life. Nordur cares about enjoying every moment of life. With a foundation close to nature and a passion for fine food, Nordur & Co aim to create products that make everyday life a little bit better. It’s about more than salt. Nordur wants to rethink the food experience and only make food products where quality, affordability, and accessibility go hand in hand. As a company, Nordur Salt Co. believes in transparency. They have a down-to-earth spirit and an open door policy. They believe that the only way they can reach their goals is by being open and honest about the business. Nordur wants to make the world better, one Nordur salt flake at a time. Nordur Sea Salt is steadily taking over the world and is now available in more than ten countries. Norður Salt comes in several shapes and sizes. From the pure Norður arctic sea salt flakes to the colorful and tasty flavors of blueberry, licorice, rhubarb, and smoked salt. Flavored salts are made in collaboration with small family businesses and celebrates our Icelandic heritage. There is a salt for every occasion. Sea Salt makes a beautiful and usable gift, for professional restaurants or simply for your own kitchen counter. 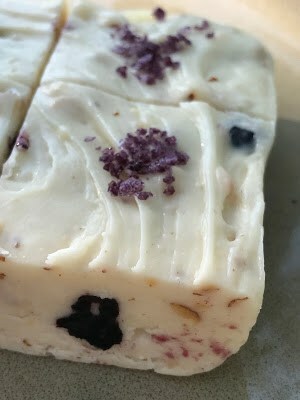 Let me reassure you, White Chocolate Blueberry Fudge is fantastic! The flavor combination works great together and believe it not, this fudge isn’t overly sweet. Dried blueberries add just the right amount of blueberry flavor and white chocolate is always delicious. I went with almonds and almond extract because I think blueberry and almond are made for each other. Dried blueberries can be found in most larger grocery stores. If you don’t have almond extract to use in this recipe, you can substitute with vanilla extract. I had whole almonds, which I ground in my mini chopper. You can easily substitute ground or chopped almonds if you prefer. A quarter teaspoon of Blueberry Icelandic Sea Salt is added to the fudge for flavor. Sea salt lightly sprinkled on each piece of fudge. This adds that extra layer of flavor for an ‘oh yeah’ to every delicious bite. Delicious Fudge……It’s not just for Christmas anymore. 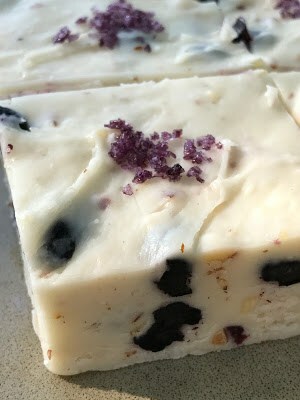 White Chocolate Blueberry Fudge is fantastic! Fudge it's not just for Christmas anymore. Line an 8 x 8-inch baking pan with heavy duty foil; grease the foil with 1/2 tablespoon butter. Measure 2 tablespoons butter, evaporated milk, sugar, and salt in a medium-sized saucepan. Bring to a boil over medium heat, then boil for 4 to 5 minutes, stirring constantly. Remove from heat and stir in marshmallows, white chocolate chips, almonds, dried blueberries and almond extract; keep stirring until marshmallows and white chocolate chips are completely melted. Pour into the foil-lined pan. Chill in the refrigerator for at least 4 hours, or until firm. Cut into squares. Sprinkle each square with blueberry salt. Store in the refrigerator, wrapped in plastic. Hi Susan, Thanks so much for your comment. I have recently switched from Blogger to WordPress and I’m in the process of trying to figure that out..You can email me at lane.lavender2@gmail.com and I will send the recipe to your. I’m also having trouble getting my Recipage to show but try this link; http://www.recipage.com/recipes.php. I’m sorry for any confusion and we are trying to get this problem solved asap. I am very interested intros site. So, how do I print our the White Chocolate Blueberry Fudge recipe in less than 22 pages?!!! And so on.